Nelson’s writing about Jeanette: “give her my continuous love & sincerity” was not to be tolerated in one of the Jeanette fan clubs. The fear of anyone taking Nelson’s word LOVE literally meant it had to be deleted from his letter! And quoted in their fan club magazine with a hanging sentence. Hence the whiteout. 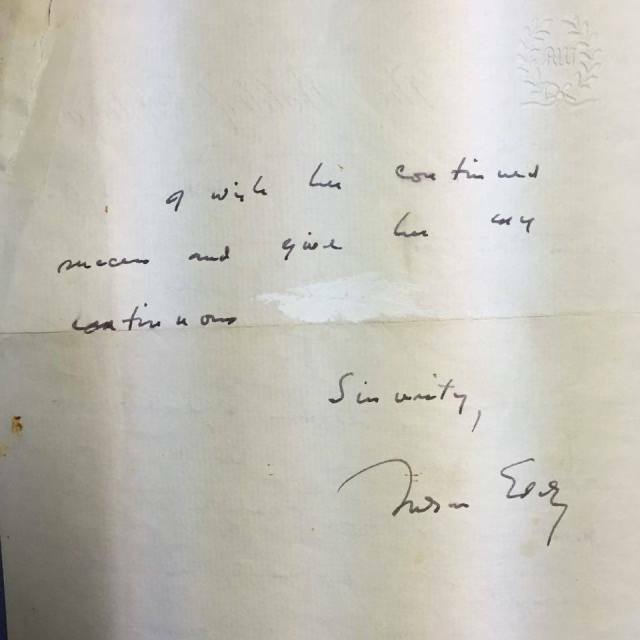 On page 2 of an original, 1960 handwritten letter by Nelson Eddy. Even though Jeanette herself published the letter elsewhere with that “offensive” word intact, Jeanette’s “official” biographer chose to quote that letter in his book but also with the word LOVE omitted. In this blog post written by Katie, you can read the whole story and see the astounding degree that these people went to in their censorship. One can’t blame some fans for believing in the happy Jeanette-Gene love fest, as this was crammed down their throats for years. The deliberate sabotage and attempts to belittle Nelson at every turn cannot be ignored. That forbidden word LOVE stricken from this fairly innocent letter boggles the mind. The dictionary definition of this word: “the quality of being free from pretense, deceit, or hypocrisy.” The first synonym listed for this word: “honesty.” Other synonyms are: genuineness and truthfulness. Nelson Eddy was a master with words and here he is offering his “continuous love & sincerity” in such a truthful but sneaky way that this probably went over the heads of most others reading it. Otherwise, who knows, the self-appointed censors might have whited out that word as well! Thanks also to Angela sharing the original letter. Nelson Eddy: Listen and weep. You will never be the same! 1. The original opera has Boris singing…”SIX years and more my reign has not been troubled.” Nelson changed it to “FIVE” years. Five years and a few weeks was exactly how long it had been since Nelson declared his to Jeanette and first wanted to marry her. Alisa notes re: the five years: “It is important to note that in his bogus interview to Photoplay after his unfortunate elopement (in a damage control article called “I’ll Tell You About My Marriage”) he states candidly, “FIVE YEARS AGO I FOUND THE IDEAL GIRL – just the one girl in the world for me.” Of course, the article is spinning this to be all about Ann Franklin. But those of you who have read Sweethearts will be familiar with other early quotes from Nelson where he speaks of Jeanette and hints repeatedly that she was his ideal girl…with subsequent bitterness that it didn’t work out with her. Thanks, Alisa, for this clarification. See my original article below which was my stunned reaction to listening this radio show last year. Such self-destructive people Nelson and Jeanette were at times on a personal level. It boggles the mind, doesn’t it? June 23, 2014: I am writing this on my iphone while in an airplane en route to Los Angeles. Should be catching up on sleep but felt compelled to share this with you. (Plus I need to learn how to upload from my phone, so bear with me!) It’s a long article but I think you’ll find the content of great interest to you. In my many years of researching this story, there have been several watershed moments. Times of learning things that were so painful – and such damning evidence – that it just made it all that more real. I have written of the many tears wept after I interviewed certain people and learned, for example, the mental cruelty and overall neglect of Jeanette MacDonald in her last week of life. It became an entire process to learn to digest said information, review it over and over until one could do so without sobbing hysterically and then trying to imagine how they could have prevented said awful incident….and why couldn’t someone have intervened… and why was everyone around them so stupidly paralyzed that they didn’t get off their duffs and do something about it? Sometimes the horror of the overall story would hit me and I would have to walk away and focus on something else in life before I could return to it. Over the ensuing decades, a few of the people who worked with me on this project gave up altogether and dropped it. For whatever reason, the story brought more personal pain than joy. But I had made a promise to Jeanette’s sister Blossom that has weighed deeply in my life. I have had to remind myself that it was my job to tell the story as best I could so folks could understand and not hate one or the other for their actions and/or missteps. In 2014 I see that some new readers to Sweethearts are a different lot, there has been acceptance of the story for many years now and this generation of readers is therefore spoiled to a degree – they take it for granted and read it as a tragic and interesting piece of Hollywood history. For some, the shock value is gone. Yet I feel that we should never, ever forget the outrage and shock value – and the efforts and tears of all the sources who contributed along the way. Without their lingering anger, so many people sworn to secrecy would never have come forward and gone on record. Because some source material remains shocking even today and can bring one to his or her knees with the pain of it – imagine what it was like for Nelson and Jeanette to actually live it! A case in point is Katie and Angela, two friends who decided to make a recent trip to DC and managed to listen to the Chase and Sanborn radio broadcast from 3 days after Nelson’s marriage to Ann Franklin. Next to Nelson’s interview the day Jeanette died, I felt that this was the most telling. I had been to DC some years back and listened to it with my screenwriter friend Judy Burns. That we were devastated and in tears experiencing that sad radio hour is an understatement. Back then it was not possible to share it but today we are blessed to have all sorts of source material show itself…so I am happy to say that at the end of this post, you will be able to experience it for yourself. But first, read on so you understand the background. To be in contact with Katie and Angela as and after they listened to this radio show, to know that they were stunned and grief-stricken and ended up listening and re-listening to parts of it in these ensuing days…I understood the process all too well. And the struggle to come back to “real” life and livingness on Planet Earth and not wallow in the sadness and unfairness of what happened to these people all those years ago – well, it was déjà vu for me. The Mac/Eddy story has the power to grip and move people and to change their thinking forever. It’s hard to “recover” from this story once the impact of it truly hits you. Katie has spoken of its impact on her on her own blog…she was also sharp to notice Nelson’s terse comment about him being given the wrong script when he finally comes to the microphone. For those unfamiliar with the circumstances – The Chase and Sanborn gang made a misguided attempt to surprise Nelson and be lighthearted and congratulate him on his marriage which went over like a lead balloon. He refused to join in the banter, wouldn’t come to the mike at first and apparently walked off after his numbers because there was none of the usual happy discussion after. Announcer Don Ameche didn’t even say, “That was great, Nelson…” There was instead silence followed by polite audience applause. In short, the show was a PR disaster. In Sweethearts you get the full back story behind Nelson’s marriage and the obviously shell-shocked state he found himself in. By now the hangover would have fully worn off and he was caught up in the whirlwind of how MGM was trying to spin the story. The logistics of this new reality had not fully hit Nelson, one can sense. Like a robot, come hell or high water, you can wind him up and he will sing…through most every happy moment or crisis in his life. Nelson Eddy…the reliable, stalwart, stouthearted performer. He performs his numbers on this show with his usual near-perfect diction but the pitch falters here and there and the particular emotions attached to his second and third numbers are terribly telling and painful to listen to. It is a certainty that Nelson was already aware of Jeanette’s reaction to his marriage – a serious attempt at offing herself which she would repeat a week later before finding a salvation of sorts in a concert tour – where the love and adoration of her fans helped her survive and find a purpose to keep on living. Isabel Eddy, Nelson’s mother, no doubt had already given her son an earful, having joined Gene Raymond at Jeanette’s bedside as she battled back emotionally from the suicide attempt. Gene was ordered to keep a watchful eye on Jeanette and Isabel continued to give her support in the coming days. In my opinion, their lives were still salvageable after Jeanette’s marriage to Gene Raymond; he never stood in the way of her getting a divorce. But that was not the case after Nelson married Ann Franklin. And it appears that this reality did not fully hit Nelson until a year later when he left on his 1940 tour. It was then that he suffered a serious nervous breakdown and had Jeanette not recently re-entered his life, one wonders whether he would have survived at all without her presence. The first section of the radio show is memorable for Nelson’s refusal to come to the microphone or to accept congratulations over his marriage. He then launches into his opening rousing number – pretty much phoning in his performance. Why would a newlywed, supposedly happy Nelson Eddy choose to sing such a downer of an aria? And if this was indeed the previously scheduled aria, would not a “happy” Nelson have said “Hey guys, I wanna sing ‘oh, what a beautiful morning’ instead!” (or some comparable cheerful song since that one hadn’t been written yet…but you get the idea). Nelson’s last song is “Little Grey Home in the West” with the lyrics from the original show, so slightly different from the movie version. The movie “Sweethearts” was still showing in theaters, having been released at the end of 1938. No doubt MGM was concerned about how Nelson’s marriage would affect the ongoing box office. It’s obvious that the original idea was to continue promoting the movie. But listen closely! Don Ameche is VERY careful introducing the song – not a single mention of Jeanette MacDonald or “Sweethearts” being in theaters at all! Ameche says solemnly, “Nelson Eddy sings the familiar ‘Little Grey Home in the West. '” End of introduction. That in itself tells you something is very seriously wrong here! Instead of singing with the loving, light tone of the movie version, I think it’s not much of an exaggeration to say that Nelson sings it more like a funeral dirge. Slow, sad, his voice is weighted down with emotion. And not in a good place emotion. Nelson barely finishes the song when the closing commercial for the coffee begins, cutting into the applause. It’s beyond painful. And the show ends. Now that I am aware of how much Nelson rewrote lyrics to suit what was going on in his life, it is obvious that the general message in this radio show is that he knows he screwed up royally, he knows there is no forgiveness and his life and love is destroyed forever. But I think it unlikely that Jeanette would have been allowed by her keepers to listen to the broadcast. Or – maybe she did – and it meant something positive to her…or negative and led to her subsequently making a more feeble, second attempt to end her life some days later (also with pills, per Marie Collick). There is scant documentation on this so we can only speculate. All we know for sure is that the next day Jeanette was out of bed and smiling for the cameras, playing the movie diva and happily accepting her “queen of the screen” award. And a few days after that, she wasn’t convinced that she wanted to go on living. She would subsequently leave MGM, go on tour and refuse to sign a new studio contract for many months. Anyone who claims Nelson’s marriage didn’t devastate her is lying to himself or herself. Nelson Eddy – the “serious singer” – such a purist and perfectionist – there are only two scenarios in which his voice would go noticeably sharp or flat. Either he was wildly happy or terribly miserable. A wildly happy moment was singing his two numbers in the Bob Hope 1954 TV show. He gets so “schmaltzy” and over-emotional singing to Jeanette that his launches onto notes can be too broad and he emotes more than sings at times. The pitch goes off. But he looks so alive and radiant one can forgive that. In this “Little Grey Home in the West” Nelson sings better than the previous aria but pain colors the mood. It should be noted that unlike most other episodes of Chase and Sanborn, Nelson has no playful banter interacting with other guests during the show, being part of a comedy skit with Edgar Bergen, or even a quick word with host Don Ameche. Nothing. So listen and learn. And thanks to both gals for making this available. In this instance, the documentation is there for you to experience…I am sure you will have your own “Oh my God it’s really true!” moment as well. Here is the link to Katie’s post, the photo above and the radio show. I’d say “Enjoy!” but am not sure that word is applicable in this case. 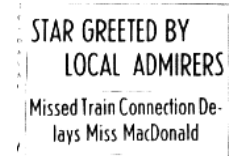 Nelson Eddy sings at FDR’s 1941 inauguration – Jeanette MacDonald secretly meets him! Another fascinating piece of detective work by Katie and Angela. Since Katie lives in Virginia, she took particular interest in Nelson’s being in that area and singing at FDR’s inauguration ceremonies in 1941. We know that Nelson’s wife Ann accompanied him, as there are photos attesting to that fact. It is a huge honor for a celebrity to sing at such an event. Both Nelson and Jeanette were friendly with FDR, Harry Truman and Eisenhower. Nelson was also said to have sung at an event for then-Senator JFK and Jacqueline. Politics aside, they were welcomed at the White House from “Naughty Marietta” onwards. And in the case of Margaret Truman, she was openly a fan of both – politics be damned! After bringing down the proverbial house in Roanoke, she cancels Asheville, NC, where she was scheduled on the 28th. (Magic! Sick again!!!) This time, her “doctor” orders her to go to Florida to recover from her “cold”. Okay, I don’t care how famous you are, when was the last time ANY of you reading this were sent to Florida to get over a cold? …All this time, not only is Gene Raymond well-documented in Los Angeles, as is Ann Eddy, there is not one SMELL of where Nelson is or what he’s doing–the only thing that seems certain is that he was NOT in California. No mention of his homecoming from Washington, which would have been mentioned by someone, somewhere. Wonderful research, Katie, and thanks for adding further proof that Jeanette and Nelson were pros at making their relationship work – even if right under the public’s nose. One wonders how minutely they scheduled their lives to make that precious time for themselves that they so needed. According to the writings of Isabel Eddy, had they not been able to do that, Nelson would have given up singing altogether in the 1940s…there is mention again and again that he would call Jeanette from the road, not certain he could go on that night, ready to chuck it all and give up. Her pep talks kept him going…and he likewise inspired her to continue as well. Question: Did they visit the White House together or even spend a night there? This story is ever-amazing, as is their crafty skill in living a life that others never knew of. If only they had realized that their fans (most of them) would have stood up and cheered to know the truth!